10 Best Teapot Clipart – Free! Today we have an exquisite collection of 10 Best Teapot Clipart Free Images. 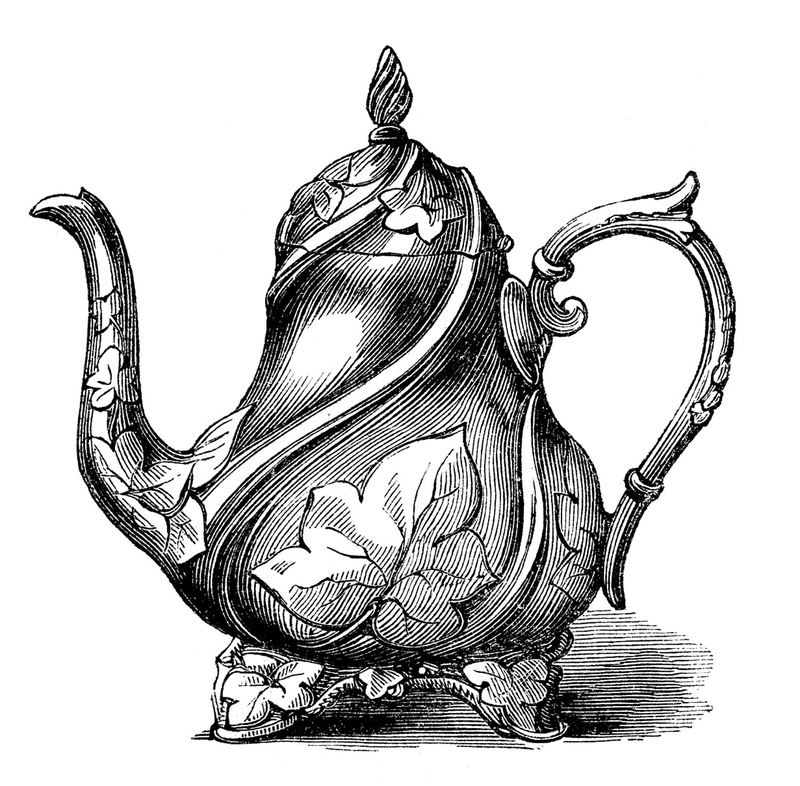 This curated assortment of stylish vintage teapot clip art images is filled with beautiful black and white illustrations. We have five tall, elegant teapots that are graceful and charming. Then we offer five sketches of small, possibly individual, teapots that are just as captivating and detailed. Some of these antique teapots would look nice framed all together, or they would be perfect for transferring onto towels, napkins, placemats etc. Others might make a nice Handmade Card for Mother’s Day! 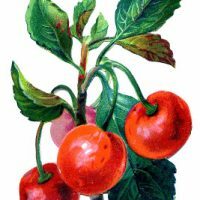 This is a nice Free Vintage Teapot Clipart Image! 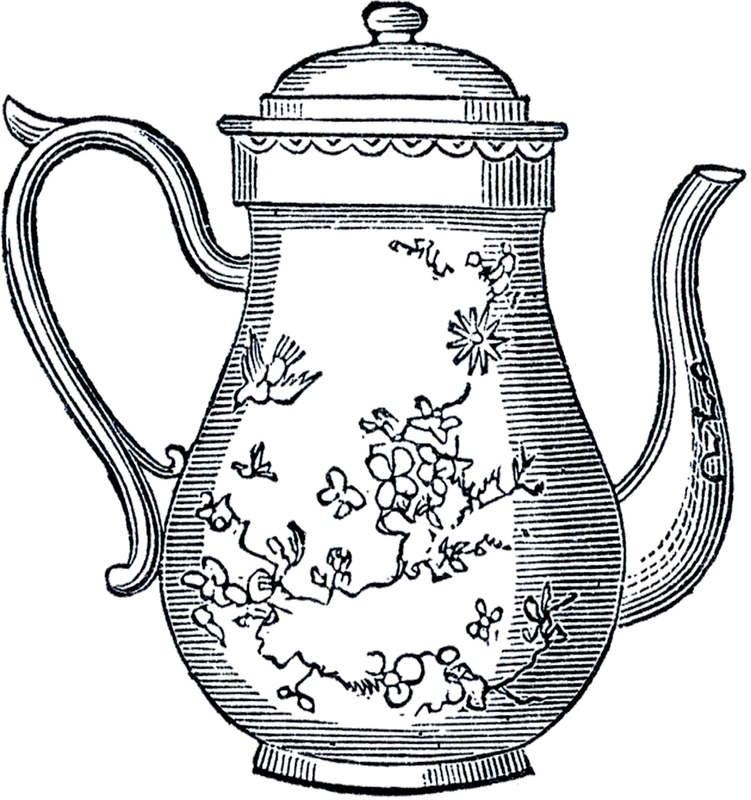 Shown above is a black and white illustration of a lovely Tall Teapot. The Teapot has a pretty Asian style design on it! The shape of it makes me think that it could have been made of Ironstone. This image was scanned from a very rare printer’s book in my collection! There’s no date in the book, but my best guess would be that it’s from around the 1880′s. Here we have a beautifully ornate Teapot from an 1850’s catalog. This one has such a great Garden Style look to it with the beautiful leaf details. Lovely! 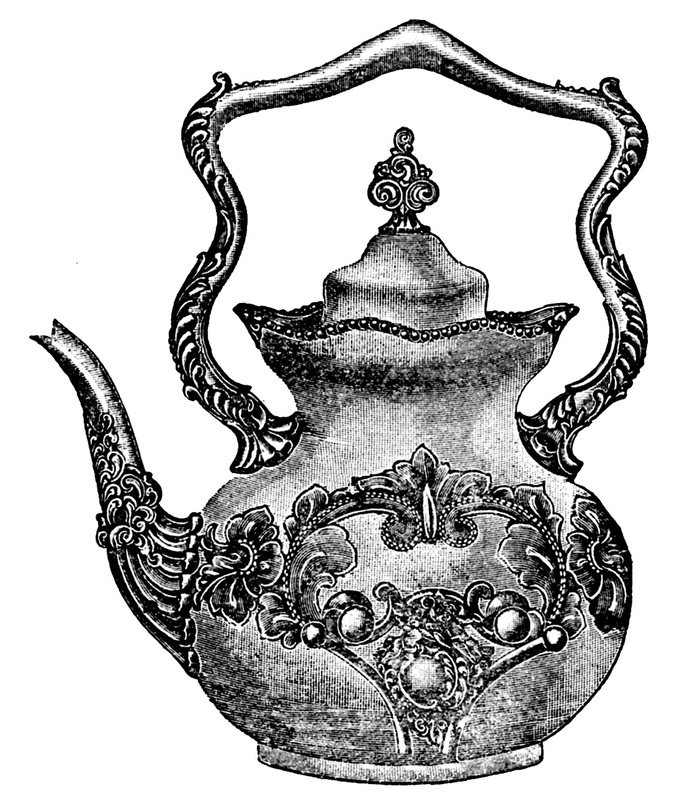 Shown above is a black and white illustration of an old Fancy Teapot. 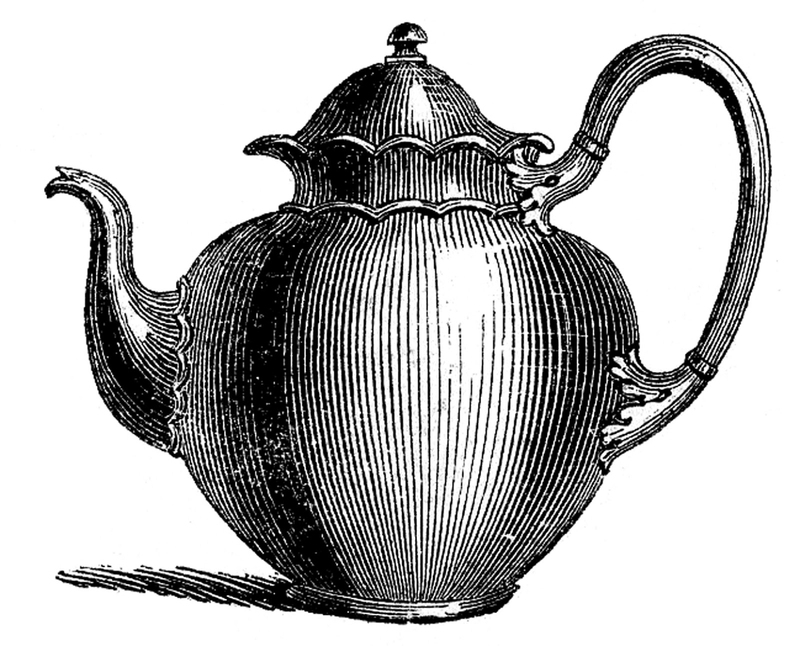 The Teapot appears to be made of metal, with a wooden handle on top and a warmer on the bottom. This is an image scanned from a very rare printer’s book in my collection! There’s no date in the book, but my best guess would be that it’s from around the 1880′s. Here is a fancy Victorian Teapot from an Antique Catalog! It would have been made in silver plate originally. The handle of this one has a lovely unusual shape. Here’s one for the Tea lovers!! 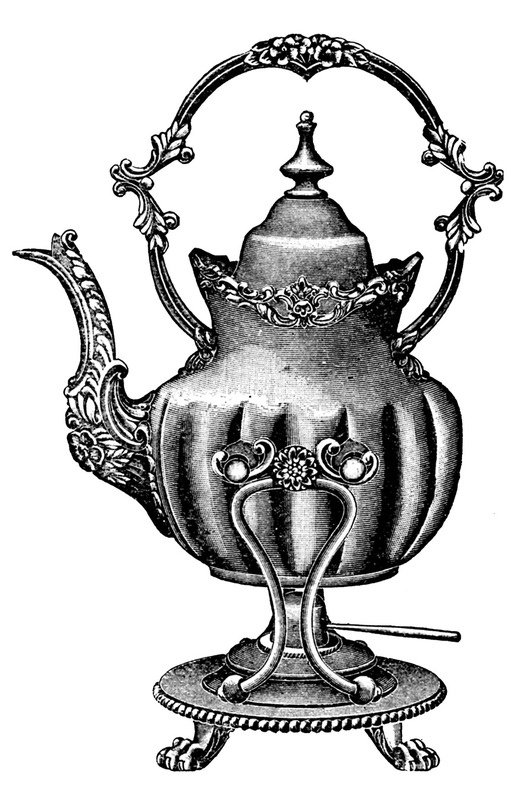 This is a grand looking Teapot from an 1899 Catalog. It’s a wonderful engraving of a silver plated piece that sold for about $20 at that time! This is a darling Vintage Asian Teapot Image! 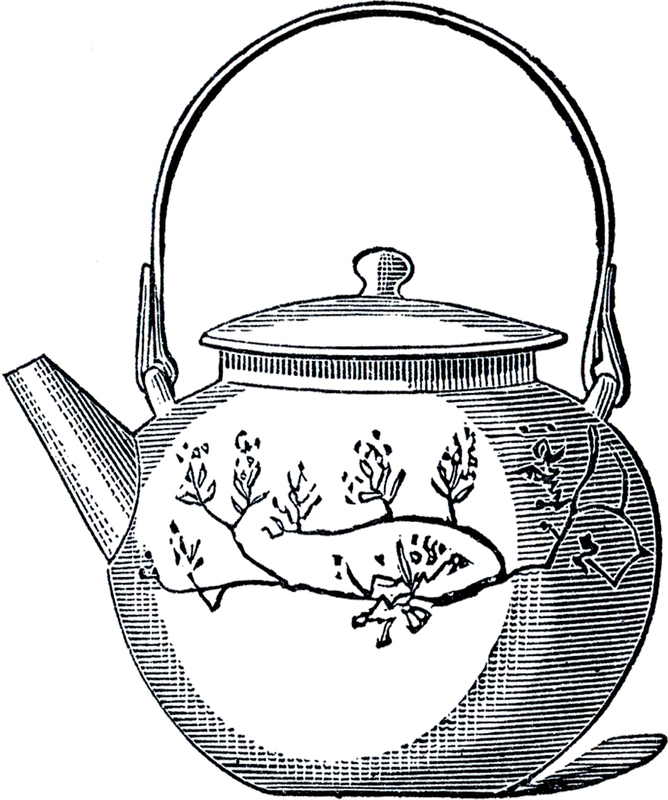 Shown above is a black and white illustration of an old round shaped Teapot. The Teapot has a lovely Asian style design on it! This is another image scanned from a very rare printer’s book in my collection! There’s no date in the book, but my best guess would be that it’s from around the 1880′s. 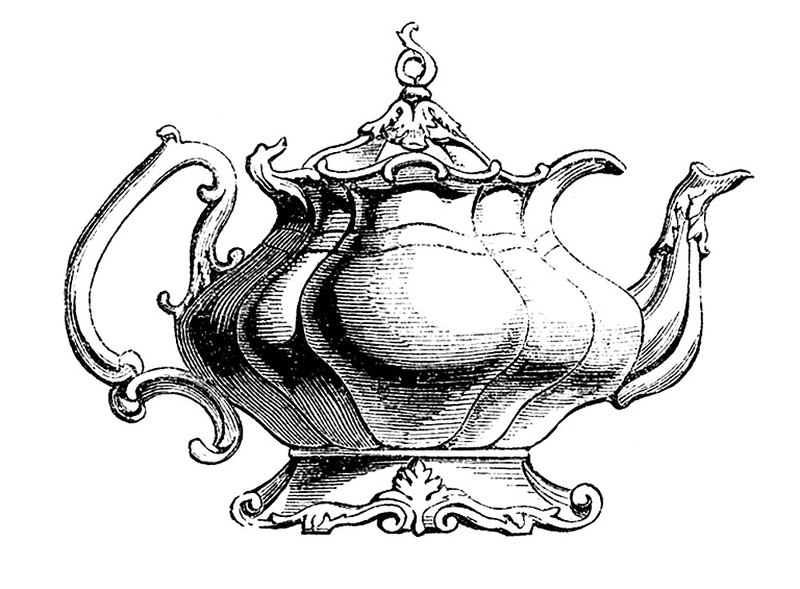 Here we have an Antique Teapot Image from an 1850’s Catalog. I love the fancy bits on the handle and spout plus the scalloped looking trim along the top edge. So cute! Above is a wonderfully ornate teapot with vines wandering around the bowl. 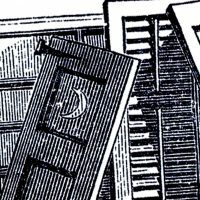 It comes from a circa 1850’s Catalogue. There are two more from the same catalog below this image. I hope you like them. Don’t you just love this teapot with daisy like flowers encircling the upper part? I imagine this beautiful individual teapot is one that a fine Victorian lady would have taken her tea in the garden. 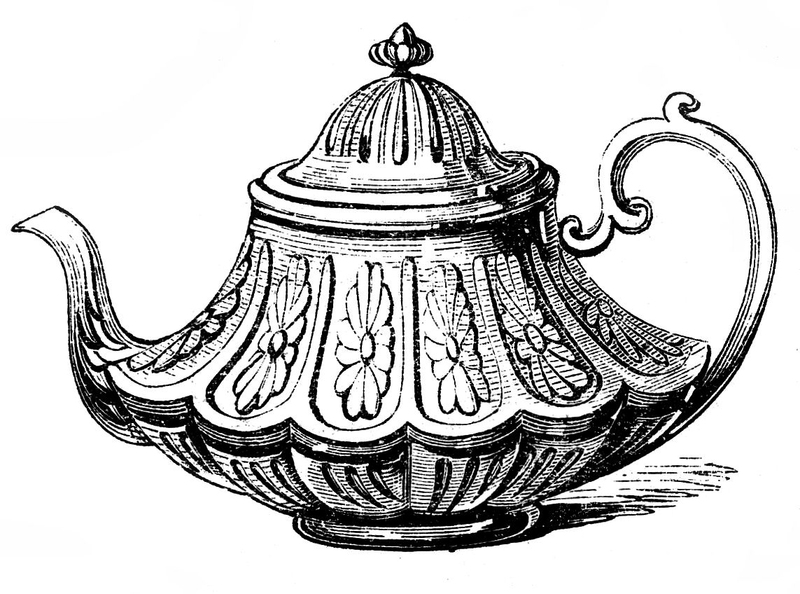 Our final Best Teapot Clip art image from my 1850’s Catalog is a truly fabulous antique teapot engraving!! I just adore the shape of this one. 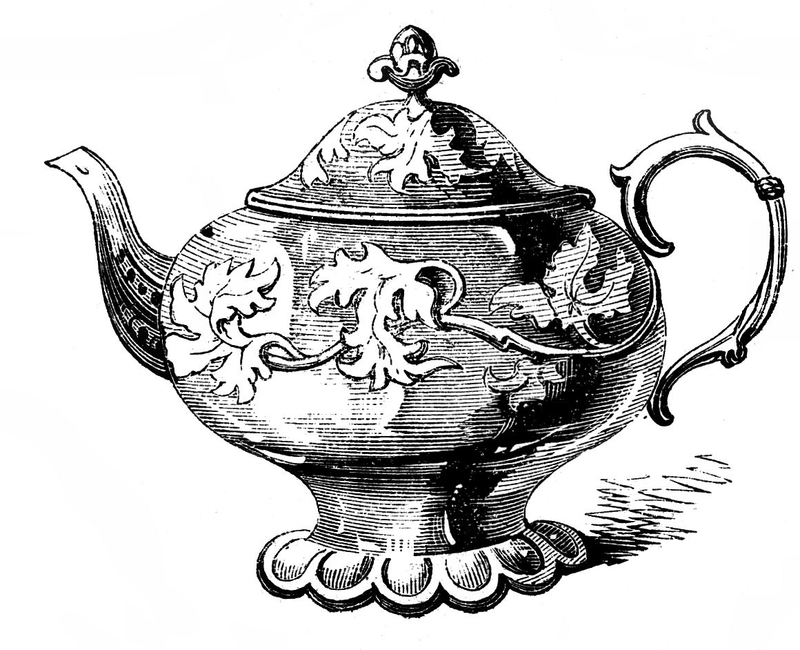 I hope you enjoyed this curated collection of 10 Best Teapot Clipart Free images. You might also like our 8 Vintage Pedestal Sink Images HERE! 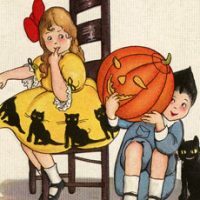 Vintage Fruit Graphic – Cherries Old Shutters Image Vintage Halloween Greeting with Children Post Card! « Vintage Paper Lace Digital Kit – Graphics Fairy Premium Membership! Beautiful art, however this is a coffee pot, not a tea pot. Tea pots are not tall and thin. They’re short and squat (remember the childhood song … “I’m a little tea pot, short and squat…” ?). 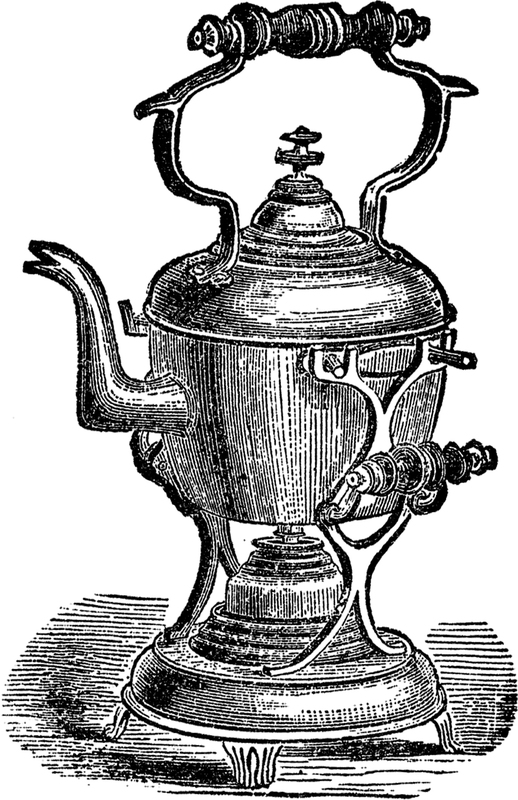 Coffee and coffee pots became much more popular in America during and after the American Revolution (that was partially about high taxes on tea). Patriotic Americans would not drink tea at that time! Fortunately, that’s long behind us, now (love my morning tea). Thanks for all the wonderful images! Thank you, Karen. It’s a lovely collection of images! Thanks so much for these exquisite engravings of teapots!!!! I see all these wonderful images online & on Facebook and want to make postcards from them. But when I go to upload them from my computer to a printing business, they say they are poor quality images and may not come out too good on a postcard. Can anyone teach me how to take an image from the internet and upload it to be printed into postcards? I’ve saved these teapot images because they are all very different and so unique. In those days, I’m sure that teapots were ‘the thing’ to not only have and enjoy but to put out their best when entertaining. I would love to have one of these rather than what they sell today. They look like royalty and last forever. There wasn’t one I could say would be my favourite. They all turned out to be favourites! I love these and thank you for sharing them with us! Thank you Irene, I do agree the tea pots of old are so very beautiful!